A cereals quartet mapped in great detail from 1969 – ragi in the old Mysore state (top left), barley in eastern Uttar Pradesh (top right), bajra in Maharashtra (bottom left), and jowar in Madhya Pradesh (bottom right). I have taken the details from the lovely set of maps in the Indian Agricultural Atlas (the third edition) of 1969, which was printed at the time by the Survey of India (which provided the base maps). It cost, in those days, 90 rupees which was a small fortune, but little wonder, for the mapwork is superior. Grain and oilseed markets mostly strengthened in the past month, the IGC daily index (GOI) up 6% to near four-month highs. The upturn reflected concerns in early February about maize and soyabean crops in South America, as well as the impact of the recent severe cold spell in parts of Europe and the CIS. Moreover, after a very high rate of shipments from the Black Sea region in the first half of the season, sales activity declined, with US grain, in particular, attracting much more buying interest. Wheat export prices in Europe climbed by some 8%, in somewhat tighter markets, with reports of logistical problems and possible future export restrictions in the Black Sea region (though denied), seen as potentially bullish. However, global supplies appear ample, with the likelihood that a portion of upcoming large South Asian wheat harvests will be offered for export. US maize (corn) values remained firm, supported by reports of crop losses in South America and active export interest for remaining old crop supplies, although forecasts of a further rise in US plantings this spring added a bearish element. Oilseed prices rallied strongly in the past month, reflecting worries about the final outcome of soyabean crops in Argentina and Brazil, good demand for US supplies, including a new trade deal with China, and rising crude oil values. International rice market trends were more mixed, with Thai prices supported by domestic support measures but those in Vietnam, especially broken grades, easing to compete with South Asian offers. 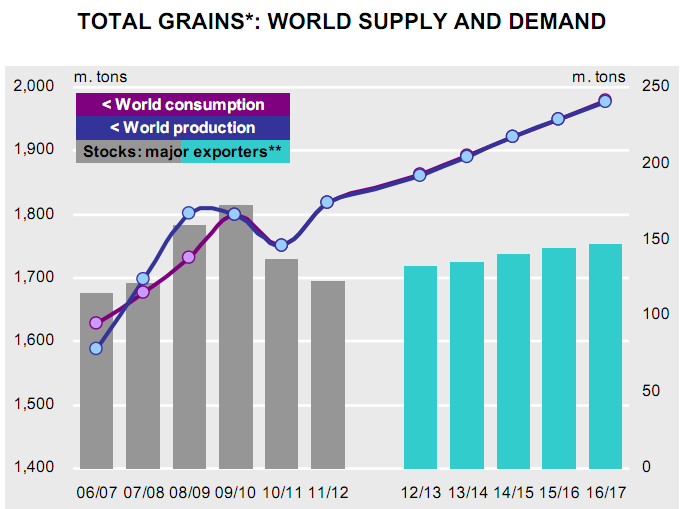 Grains: The world production estimate is lifted by 11m. tons, to 1,841m., largely because of upward revisions in Australia, Kazakhstan, Ukraine, India and Brazil, the latter because losses of its main maize crop will likely be more than compensated by a larger second crop. These upward revisions outweigh a reduced maize figure for Argentina. To an extent, the forecast of world consumption is adjusted higher to reflect the bigger crop estimates, with total use of grains placed 5m. tons above the January forecast, at 1,836m. The change is mainly for feed use, now put at 775m. tons, 4m. more than before and 4% higher than in 2010-11. 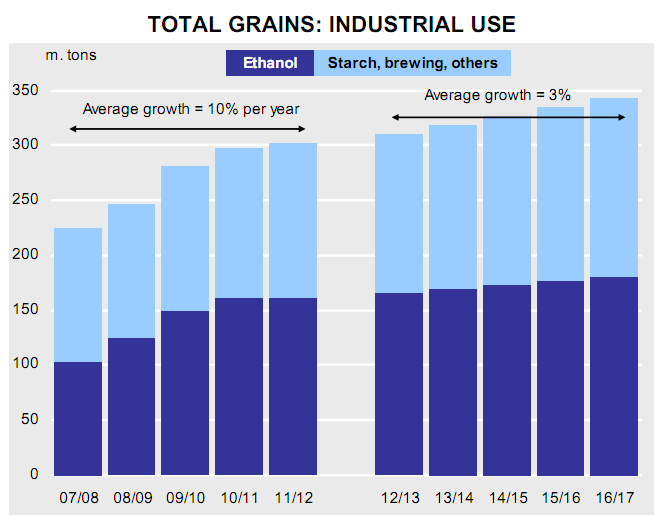 Of particular interest is the marked slowdown in the annual increase in industrial use, expected to rise by only 2% this year, with ethanol use of maize in the US set to recede slightly from its peak in 2011. While the latest statistical forecasts of supply and demand suggest that, nominally, global carryover stocks will rise slightly in 2011-12 from last year’s low figure, to 378m. tons (373m. ), the total carryover in the eight major grain* exporters is still expected to dip by 6m. tons, to 131m., the smallest figure since 2007-08. Wheat: A further increase in the global wheat production estimate for 2011-12, to 695m. tons (653m. ), boosts total availabilities to 892m., their highest ever. Projected food and industrial consumption are both revised lower this month, but attractive prices, particularly compared with maize, lift the forecast of feed use by 2m. tons, to 131m. (115m. ), the most since the early 1990s. Strong feed wheat demand is reflected in the global trade figure, helping to lift total wheat trade to match the 2008-09 peak, at 136.8m. tons (125.7m.). Even though total consumption is growing at a faster than average pace, world stocks are projected to rise to 211m. tons (196m. 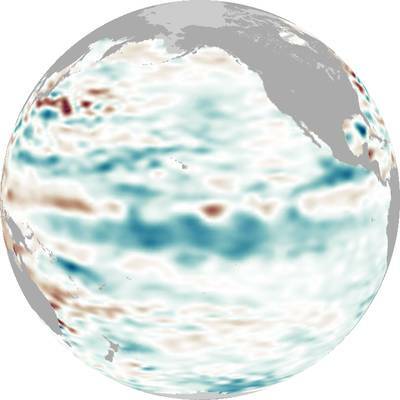 ), eclipsing the previous record in 1999-00. 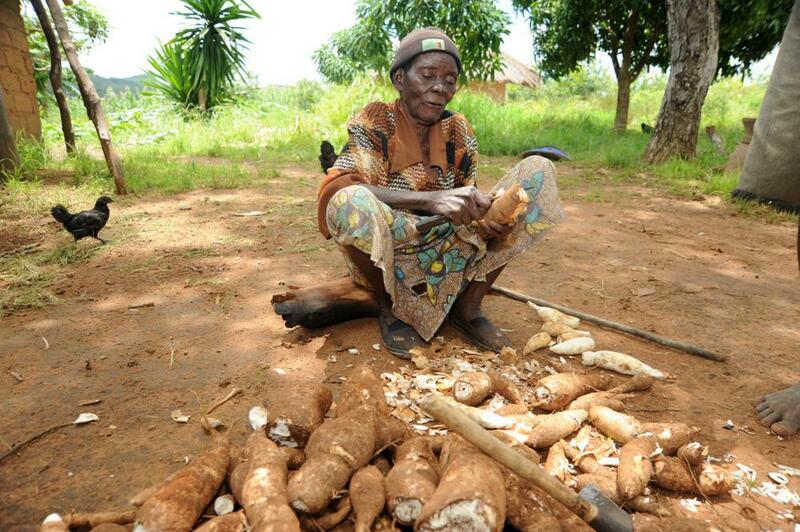 Maize (Corn): Maize production in 2011-12 is expected to increase by 4%, to a record 864m. tons. The US crop, while disappointing, was slightly above average, and bumper harvests were collected in China, Ukraine and the EU. A severe drought has reduced yield prospects in South America, especially in Argentina, but Brazil remains on track to produce a record crop. Improved supplies in some countries are boosting consumption, with overall use forecast at a record high. Feed use of maize is expected to increase at a faster than average pace but, with US ethanol production likely to decline slightly, the rise in industrial demand will be below trend. With demand outpacing the increase in supplies, ending stocks are forecast to tighten further, including in the US. Amid solid buying by a number of importers, world trade is forecast to rise to a four-year high. Barley: Better than expected 2011-12 harvest results, including in Argentina and Australia, lift the estimate of world barley production by 1.1m. tons compared with last month, to 134.7m. World consumption is expected to remain steady, contained by uncompetitive prices in the feed sector, especially in the EU, and by sluggish growth in brewing demand. While higher than previously forecast, carryover stocks are set to remain tight, particularly in the EU and North America. The projection of world trade is raised by 1.2m. tons, to a three-year high of 17.8m., with a steep upturn in buying by Saudi Arabia. Rice: Due to increases in Asia’s biggest producers, China and India, global rice output is projected to rise by 3% in 2011-12, to 463m. tons. The record outturn will be accompanied by a further expansion in demand, to 460m. tons (449m. ), but the 2011-12 carryover is still expected to increase by 4%, to 99m. Much of the forecast rise in global stocks will be due to increases in the major exporters, notably in India and Thailand, seen 14% higher, at a record 32.7m. tons. World trade in 2012 is forecast to contract by 7%, to 32.2m. tons, owing to significantly reduced purchases by key Asian buyers, including Bangladesh and Indonesia. Ocean freight rates between major export-import regions. The World Agricultural Supply and Demand Estimates (WASDE) for 2012 February have been released by the United States Department of Agriculture (USDA, through its Economic Research Service of the Foreign Agricultural Service). Here are the important numbers: total wheat production 692.88 mt, total wheat exports 140.25 mt (of which 26.54 mt is US, the former Soviet Union countries (12) is 35.21 mt); total coarse grains production 1,142.19 mt (coarse grains include corn, sorghum, barley, oats, rye, millet, and mixed grains), total coarse grains exports is 119.81 mt; total world corn production is 864.11 mt; total world rice production is 462.75 mt. Wheat – Global wheat supplies for 2011-12 are projected 2.1 million tons higher with larger beginning stocks in Kazakhstan and increased production for India, Kazakhstan, and Morocco. Kazakhstan beginning stocks are raised 0.6 million tons with reduced domestic consumption for 2010-11. India production for 2011-12 is increased 0.9 million tons reflecting the latest government revisions, which increased yields for the crop that was harvested last spring. Kazakhstan production is raised 0.2 million tons based on the recent official estimate. Production for Morocco is raised 0.2 million tons also on official revisions to estimated yields in a crop that was harvested several months ago. Global trade is raised slightly for 2011-12 with world imports increased 0.7 million tons. Small increases in imports are made for Saudi Arabia, Mexico, Chile, and Ethiopia. Export reductions for Ukraine, Canada, and India are more than offset by increases for Russia, the United States, Argentina, and Brazil. 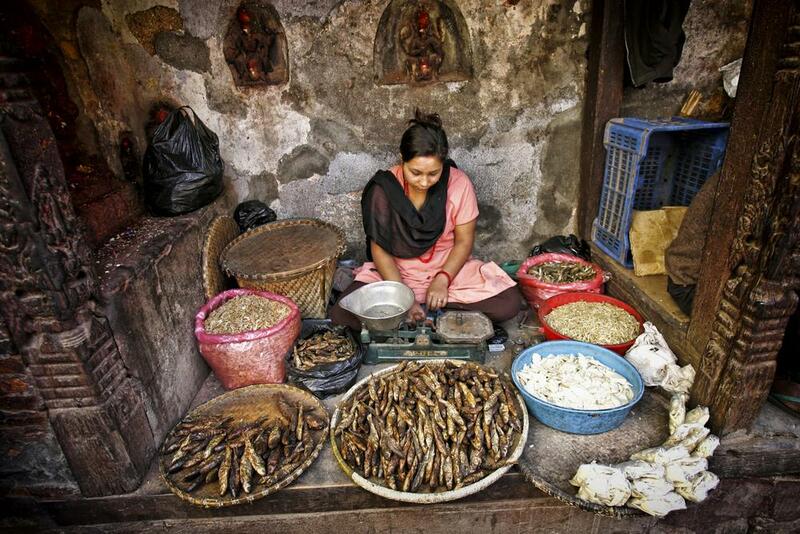 Global wheat consumption is reduced 1.0 million tons mostly reflecting a 1.6-million-ton reduction in India food use. Partly offsetting are small increases in food use for Australia, Chile, Ethiopia, and Kazakhstan. Global wheat feeding is nearly unchanged with a 1.0-million-ton reduction for Kazakhstan offset by increases for Ukraine, Saudi Arabia, Canada, and Mexico. Global ending stocks for 2011-12 are raised 3.1 million tons to a record 213.1 million. As projected, 2011-12 global wheat stocks would be 2.4 million tons higher than the previous record in 1999-2000. Coarse grain – Global coarse grain supplies for 2011-12 are projected 3.1 million tons lower mostly reflecting reduced corn production prospects in Argentina and, to a lesser extent, Paraguay. Argentina corn production is lowered 4.0 million tons to 22 million as field reports confirm that high temperatures and extensive dryness during pollination in late December and early January resulted in irreversible damage to early corn in the central growing region. Late planted corn, which has been on the increase in recent years, will help offset some of the earlier losses, but additional rainfall is needed to stabilize production prospects. Corn production is lowered 0.4 million tons for adjacent Paraguay where hot, dry weather also reduced area and yields. Partly offsetting are small corn production increases for EU-27 and the Philippines. Global barley production is raised with Argentina production up 0.7 million tons on higher reported area and yields for the crop that was harvested during late 2011. Global coarse grain trade for 2011-12 is raised with higher corn imports for EU-27 and higher barley imports for Saudi Arabia, EU-27, and Jordan. Partly offsetting is a reduction in corn imports for Canada. Higher corn exports for a number of countries offset a 4.5-million-ton reduction for Argentina. Along with the projected increase for the United States, corn exports are raised 2.0 million tons for Ukraine, 0.5 million tons each for Brazil and EU-27, and 0.2 million tons for Russia. Barley exports are lowered 1.0 million tons for Ukraine, but raised 0.7 million tons for Russia, 0.5 million tons for Argentina, and 0.3 million tons each for Canada, EU-27, and Kazakhstan. Global coarse grain consumption for 2011-12 is raised slightly with higher barley feeding in Ukraine and Jordan and higher corn feeding in Argentina and Ukraine. Corn feeding, however, is lowered for Canada and barley feeding is lowered for Kazakhstan and Saudi Arabia. Saudi Arabia is expected to rebuild stocks as world barley production has rebounded from a 40-year low in 2010-11. Global coarse grain ending stocks for 2011-12 are lowered, with a 2.8-million-ton reduction in corn stocks and a 0.6-million-ton reduction in barley stocks. At the projected 125.4 million tons, global corn ending stocks would be the lowest since 2006-07. Rice – Global 2011-12 projections of rice production, consumption, trade and ending stocks are raised from last month. The increase in the global rice production forecast is due mostly to increases for India and the Philippines, which are partially offset by reductions for Brazil, Egypt, Argentina, and the United States. The U.S. rice crop (milled equivalent basis) is lowered slightly resulting entirely from the decrease in the average milling yield. India’s rice crop is forecast at a record 102 million tons, up 2 million from last month due to an increase in both harvested area and yield. According to the U.S. agricultural counselor in New Delhi, favorable 2011 monsoon rains coupled with overall good weather conditions in the major rice producing areas supported higher kharif rice acreage and productivity. The Brazil rice crop is lowered 340,000 tons due to the effects of drought in Rio Grande do Sul, an important rice producing State. Global exports are raised by 1.4 million tons, primarily due to an increase for India and Egypt, which are partially offset by reductions for Thailand, Vietnam, and the United States. Forecast India exports are raised 2 million tons to a record 6.5 million tons, while exports for Thailand and Vietnam are lowered 500,000 and 200,000 tons, respectively. Forecast imports are sharply raised for Egypt based on information from the agricultural counselor in Cairo. Global ending stocks are up slightly from last month to 100.1 million tons mainly due to an increase for the Philippines. The International Grains Council (IGC) has prepared a summary of projections for grains and cereals. The IGC Secretariat has said of its work that “the figures represent the Secretariat’s view of the general development of the global grains economy in the period to 2016-17, taking into account a number of broad assumptions”. * World grains production in 2016-17 is projected to reach 1.98bn tons, a 158m. increase (+9%) compared with 2011-12; wheat output is forecast to rise by 30m. (4%) and maize by 94m. (11%). * Despite heightened economic uncertainty, the analysis assumes any slowdown in global economic growth will be temporary and increasing prosperity will boost grains consumption, particularly for feed and industrial uses. Feed use is expected to rise at a slightly faster pace than in recent years, while increases in industrial use will slow from the very rapid rates in the past decade. Diversifying diets, particularly in favour of livestock products, will slow the rise in direct use of grains for human food. Total grains consumption is projected at 1.98bn. tons in 2016-17 (1.83bn. in 2011-12), including 659m. (630m.) for human food, 846m. (769m.) for feed and 343m. (302m.) for industrial uses. World grains stocks are forecast to show little change in the medium term and are set to remain relatively tight, especially for maize. At the end of 2016-17, world grain carryover stocks are projected at 354m. tons (compared with 360m. at the end of 2011-12), including 118m. (123m.) of maize, 196m. (202m.) of wheat and 26m. (23m.) of barley. * World grains trade is projected to increase by about 2% per year, to 273m. tons in 2016-17, with wheat and maize rising to new records. Increasing demand for wheat-based foods will lift wheat import needs in Africa and Asia. Imports of maize for feed will rise, especially in Pacific Asia, with China seen as a more regular buyer. * Increases in world wheat production in the five years ending 2016 are expected to be broadly matched by use, and global stocks are expected to be maintained at close to recent levels. * Planting decisions will be influenced by likely attractive prices for alternative crops, especially maize and oilseeds. Nevertheless, some rise in global wheat area is anticipated, led by gains in the CIS. After a relatively sharp increase of 1.6% in 2012-13, including a recovery in North America, global areas are projected to expand by around 0.4% annually. Taking into account slightly increased average yields over the period, world wheat production is projected to reach a record 714m. tons in 2016-17, representing an increase of 30m. compared with the estimate for 2011. * World wheat consumption is projected to grow by 1.1% annually, close to the long-term average, reaching 716m. tons in 2016-17, up by 39m. compared with 2011-12. A continued increase in human food use accounts for half the rise, driven by expanding demand in developing countries. At 0.8% per year, the average annual increase is only slightly slower than the longer-term trend of 1.0%. Increases in world feed use mainly reflect a tight S&D outlook for maize and expectations that the cost of wheat will be more attractive than maize at times. Gains in industrial use are expected to accelerate, particularly for biofuels, although overall amounts will remain small relative to total consumption. * World wheat carryover stocks are projected to stay relatively ample in the next five years, receding only slightly, to 196m. tons. Those in the eight major exporters are projected to show an initial rise, but then fall back to about the same level as currently. * World wheat trade to 2016-17 is forecast to increase by around 2% per year, reaching a fresh record of 138m. tons. Increases in milling wheat trade will be sustained by rising demand in developing countries in Asia and Africa, while feed wheat may show some further gains if import costs are competitive with maize. * Only a modest expansion in the global paddy (rice) area is forecast in the five years to 2016-17, with the average year-on-year increase projected at just 0.3% (compared to an average of 0.7% in the prior five-year period). To some extent, this reflects an expected contraction in China’s sowings, amid a continued shift to diets that are richer in protein. Taking into account slightly reduced average yield gains, global rice production (milled basis) is projected to increase by 23m. tons, to 482m. by 2016-17, an annual average growth rate of 1%. * Global rice consumption is projected to reach 482m. tons by 2016-17, up by 25m. from 2011-12. At 1.1%, average growth, while broadly in line with the global population trend, will be lower than in previous years. This is due to a forecast contraction in China, as well as more moderate growth in other parts of Asia. Elsewhere, sub-Saharan Africa is expected to be one of the fastest growing regional markets, the result of a rising population and a shift away from traditional, locally-grown cereals. * The world rice carryover is projected to rise only slightly over the next five years, to 103m. tons. In the five major exporters, stocks are expected to initially increase – centred on inventory accumulation in India and Thailand – before edging slightly lower. Their share of the world total will average around one-third through to 2016-17. * Global rice trade is projected to expand by nearly 3% annually, to 37.2m. tons by 2017, broadly in line with maize but comfortably exceeding the year-to-year rise in wheat. Growth will be underpinned by larger shipments to Far East Asia, especially the Philippines, and sub-Saharan Africa. The latter sub-region will remain heavily dependent on imports to meet domestic requirements; their share of total consumption is forecast to average 45%. * The supply and demand for maize (corn) is projected to remain tight, with world inventories projected to drop to historically low levels. * With firm global demand and generally tight availabilities expected to support world prices, maize plantings are projected to remain high across the forecast period. Increases in area and improvements in yields, especially in the US, Latin America and China, result in large consecutive crops. World maize production is forecast to increase to 949m. tons in 2016-17, some 94m. higher than the estimate for 2011. * Global maize consumption is projected to rise to 949m. tons in 2016-17, up by 86m. from 2011-12. Growth in use is forecast to decelerate, mainly due to slowing industrial demand. With use for ethanol in the US levelling out, industrial consumption is projected to rise by 2% annually, compared to 12% in the last five years. Despite high prices, rising meat demand in developing countries will lift feed maize consumption by around 2% per year. Population growth, rising per capita incomes and changing dietary preferences are expected to boost meat consumption in parts of Asia, Latin America and Africa. * World closing stocks are expected to tighten but, with supply and demand seen broadly in balance towards the end of the forecast period, the projected 2016-17 carryover of 118m. tons would only be 5m. below that at the end of 2011-12. US ending stocks are forecast to increase from recent lows, but China’s will decline. Wheat – Global wheat supplies for 2011-12 are projected 2.6 million tons higher mostly reflecting higher production in Kazakhstan and EU-27. Kazakhstan production is raised 2.0 million tons as an extended harvest period capped off a nearly ideal growing season, confirmed by the latest government reports. EU-27 production is raised 1.2 million tons with further upward revisions for France and Spain and higher reported production in the United Kingdom and Czech Republic. Partly offsetting these increases is a 0.5-million-ton reduction for Argentina and 0.3-million-ton reductions for both Algeria and Ethiopia. World wheat trade is raised for 2011-12 with higher expected imports for China, a number of African countries, including Morocco and Algeria, as well as for Brazil and several FSU-12 countries neighboring Kazakhstan. Partly offsetting is a reduction in projected imports for South Korea where more corn feeding is expected. Exports are raised 1.0 million tons each for EU-27 and Russia reflecting larger supplies in EU-27 and the continued heavy pace of shipments from Russia. Global wheat consumption for 2011-12 is raised 2.4 million tons with increased feeding expected for Kazakhstan, Brazil, and Serbia. Larger crops in Kazakhstan and Serbia support more wheat feeding. Recent rains in southern Brazil have reduced wheat quality in some areas raising the potential for more feeding. Higher consumption is also expected for EU-27, Ethiopia, Kenya, and several smaller FSU-12 countries. Global ending stocks are projected 0.2 million tons higher. Rising stocks in Kazakhstan, China, and Morocco are partly offset by reductions in major exporting countries including Russia, Argentina, and EU-27. You can get the WASDE 2011 November outlook here [pdf] and the 2011 November Excel file is here [xls]. Current and historical WASDE data are here. Coarse grain – Global coarse grain supplies for 2011-12 are projected slightly lower with reduced U.S. corn production and lower EU-27 rye production more than offsetting higher Argentina sorghum production, higher EU-27 corn, barley, oats production, and higher Kazakhstan barley production. Corn production is lowered for a number of countries with the biggest reduction for Mexico where production is lowered 3.5 million tons. 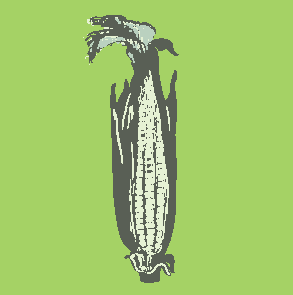 A late start to the summer rainy season and an early September freeze in parts of the southern plateau corn belt reduced yields for Mexico’s summer crop. Lower expected area for the winter crop, which will be planted in November and December, also reduces 2011-12 corn production prospects. Reservoir levels are well below those necessary to sustain a normal seasonal draw down in the northwestern corn areas which normally account for 70 to 80 percent of Mexico’s winter corn crop. Increases in 2011-12 corn production for a number of countries partly offset reductions in Mexico, the United States, and Serbia. Corn production is raised 2.5 million tons for China with increases in both area and yields in line with the latest indications from the China National Grain and Oils Information Center. EU-27 corn production is raised 1.9 million tons mostly reflecting higher reported output in France, Romania, and Austria. Argentina production is raised 1.5 million tons with higher expected area. FSU-12 production is raised 0.7 million tons with higher reported yields in Belarus and Russia. There are also a number of production changes this month to corn and sorghum production in Sub-Saharan Africa which reduce coarse grain production for the region. World coarse grain trade for 2011-12 is raised with increased global imports and exports of barley and corn. Barley imports are raised for Algeria, Saudi Arabia, and Jordan with exports increased for EU-27 and Russia. Corn imports are increased for China, Mexico, and South Korea. Higher expected corn exports from Argentina and EU-27 support these increases. Higher sorghum exports from Argentina offset the reduction in expected U.S. sorghum shipments. Global corn consumption is mostly unchanged with higher industrial use and feeding in China and higher corn feeding in EU-27 and South Korea offsetting reductions in Mexico and the United States. 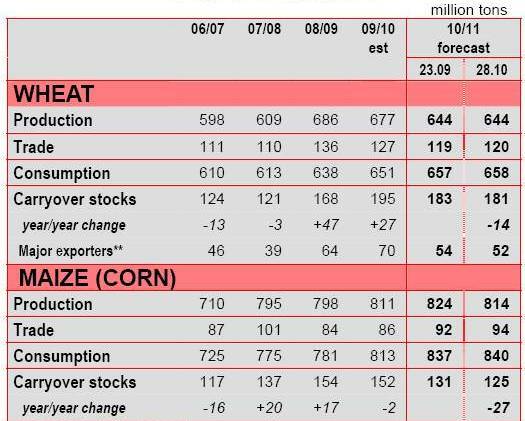 Global corn ending stocks are projected 1.6 million tons lower with reductions in EU-27, Mexico, Brazil, and the United States outweighing increases for China and Argentina. Rice – Global 2011-12 rice supply and use are lowered from a month ago. World 2011-12 production is forecast at a record 461.0 million tons, down 0.4 million from last month due mainly to decreases for Burma, Cambodia, Laos, and Thailand, which are partially offset by an increase for China. Thailand’s 2011-12 rice crop is lowered nearly a million tons as losses in the main-season crop from recent flooding are partially offset by an expected re-planting of some of the main season crop in the Northern Region along with an expected record dry-season crop. Flooding also lowered crop prospects in Burma, Cambodia, and Laos. China’s 2011-12 crop is raised 2.0 million tons to a record 141.0 million, due to an increase in harvested area. Harvested area is increased based on recent indications from the government of China. The increase in global consumption is due mostly to an increase for China. Global exports are lowered slightly due to reductions for Burma and Cambodia, which are partially offset by increases for Argentina and Brazil. Global ending stocks for 2011-12 are projected at 100.6 million tons, down 0.8 million from last month, but an increase of 2.6 million from the previous year. The heatwave of mid-2011 is reflected in the latest World Agricultural Demand and Supply Estimates (WASDE), from the US Department of Agriculture, for 2011 September. The numbers and the accompanying commentary show just how badly this year’s scorching temperatures and insufficient rainfall has affected the outlook for corn, soybeans and cotton, as Worldcrops has observed. Worldcrops has said that the most serious supply-demand tightness of these three agricommodities will be felt in corn, with a stocks-to-use ratio by the end of August 2012 now put at 5.3%. The national average yield in the US is forecast to be 148.1 bushels/acre, 4.9 bushels less than last month’s report and a massive 16.6 bushels below the record set in 2009-2010. Nevertheless this would still be the third biggest crop ever. The USDA has slashed projected corn use for 2011-2012 by 100 million bushels – but only cut expected corn-for-ethanol usage by a meagre 50 million bushels. By August next year the US ending stocks will be, according to the report, 672 million bushels. That’s a drop in the bucket and by rights – and barring a global macroeconomic disaster – we ought to see $8/bushel corn futures sooner rather than later. Not least because the later the corn matures in the ground, the greater the risk of early frost damage. Wheat – Global wheat supplies for 2011-12 are projected 7.6 million tons higher mostly on larger beginning stocks in Canada and increased production for Canada, EU-27, and Ukraine. Beginning stocks for Canada are raised 1.3 million tons and production is raised 2.5 million tons, both reflecting the latest estimates from Statistics Canada. EU-27 production is raised 2.3 million tons with increases for Germany, Romania, France, Spain, and Bulgaria as harvest reports and revisions to official estimates continue to indicate higher yields. 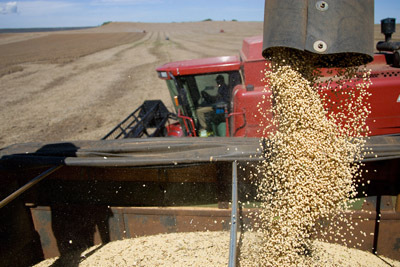 Production for Ukraine is raised 1.0 million tons based on the latest harvest reports. Other smaller production changes include 0.2-million-ton increases for both Brazil and Morocco, and a 0.2-million-ton reduction for Uzbekistan. World wheat trade is raised slightly for 2011-12 with increased imports projected for the United States and Uzbekistan. Global exports are also raised as higher expected shipments from Canada and EU-27 more than offset reductions for the United States and Turkey. Global wheat consumption is increased 1.9 million tons with higher expected wheat feeding in Canada, China, Morocco, and Turkey more than offsetting a reduction for Russia. 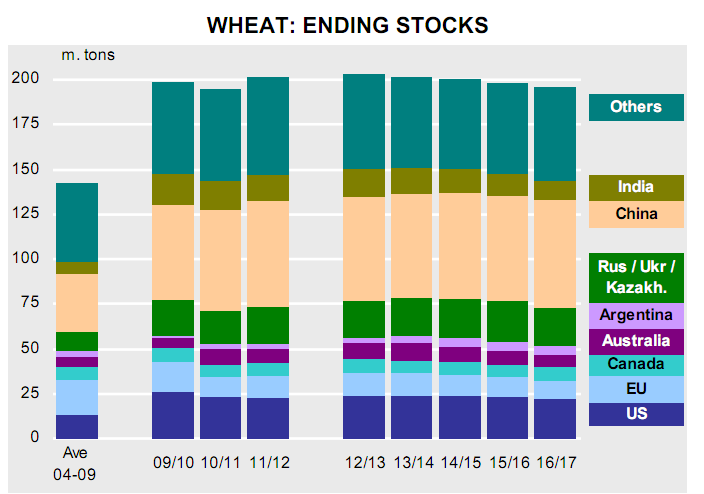 World wheat ending stocks for 2011-12 are projected 5.7 million tons higher at 194.6 million. At this level, global stocks would be up from 2010-11 and the second largest in the past decade. Coarse grain – U.S. feed grain supplies for 2011-12 are projected lower this month with reduced corn production as summer heat and dryness continue to be reflected in survey-based yield forecasts. Corn production for 2011-12 is forecast 417 million bushels lower with expected yields down from last month across most of the Corn Belt. The national average corn yield is forecast at 148.1 bushels per acre, down 4.9 bushels from August and 16.6 bushels below the 2009-10 record. As forecast, this year’s yield would be the lowest since 2005-06. Despite the lower yield, production is forecast to be the third highest ever with the second highest planted area since 1944. Total corn supplies for 2011-12 are lowered 442 million bushels with a 20-million-bushel reduction in carryin and a 5-million-bushel reduction in expected imports. Beginning stocks for 2011-12 drop with small increases in 2010-11 exports and use for sweeteners reflecting the latest available data. lmports for 2011-12 are reduced with the smaller forecast corn crop in Canada. Supplies for 2011-12 are projected to be the lowest since 2006-07. Total corn use for 2011-12 is projected 400 million bushels lower with tighter supplies. Projected feed and residual use is reduced 200 million bushels mostly reflecting lower expected residual disappearance with the smaller forecast crop. Corn use for ethanol is projected 100 million bushels lower with higher expected corn prices and continued weakening in the outlook for U.S. gasoline consumption as forecast by the Energy Information Administration. Corn exports for 2011-12 are projected 100 million bushels lower with increased supplies and exports expected from Ukraine, Argentina, and Brazil. U.S. ending stocks are projected 42 million bushels lower at 672 million. The stocks-to-use ratio is projected at 5.3 percent, compared with last month’s projection of 5.4 percent. The season-average farm price is projected 30 cents per bushel higher on both ends of the range to a record $6.50 to $7.50 per bushel. Global coarse grain supplies for 2011-12 are projected 3.1 million tons lower with larger barley, sorghum, millet, and oats supplies only partly offsetting the reduction for corn driven by the U.S. changes. Global corn supplies are reduced 4.5 million tons as increases in foreign beginning stocks and production partly offset the reduction in U.S. supplies. Projected global corn production for 2011-12 is lowered 5.9 million tons as a 4.8-million-ton increase in expected foreign output is outweighed by the 10.6-million-ton U.S. reduction. Brazil and Argentina production for 2011-12 are raised 4.0 million tons and 1.5 million tons, respectively, on higher expected area with rising returns for corn in both countries. Ukraine corn production is raised 1.5 million tons based on indications for higher yields. Production is raised 1.0 million tons for EU-27 with higher expected yields in France and several countries in Eastern Europe. Production is lowered 1.0 million tons for Canada based on the latest Statistics Canada estimates. Production is also lowered 2.1 million tons for Egypt as lack of government restrictions on planting resulted in a sharp shift in acreage away from corn and into rice. Global coarse grain trade for 2011-12 is raised slightly with increased foreign trade in barley and corn more than offsetting the reduction in U.S. corn shipments. Barley imports are raised for Saudi Arabia and Syria with larger shipments expected from Ukraine and Russia. Corn exports are raised for Ukraine, Argentina, Brazil, and EU-27. Corn exports are lowered for Canada and Paraguay. Global corn consumption for 2011-12 is lowered 7.3 million tons, mostly reflecting lower expected use in the United States. Foreign corn feeding and consumption are nearly unchanged. World corn ending stocks are projected up 2.9 million tons with increases in South America, Ukraine, and EU-27 more than offsetting the reduction projected for the United States. Rice – All rice beginning stocks for 2011-12 are lowered 2.7 million cwt from last month to 48.4 million (rough-equivalent basis) based on USDA’s Rice Stocks report released on August 26. The import projection is raised 1.0 million cwt to 19.0 million as it is expected that more long-grain rice will be imported due to tighter domestic supplies. Exports for 2011-12 are projected at 93.0 million cwt, down 4.0 million cwt from last month, and down 18.6 million from the revised 2010-11 estimate. Long-grain exports are lowered 5.0 million cwt from last month to 61.0 million, and combined medium- and short-grain exports are raised 1.0 million to 32.0 million. The decrease in the export projection is due mostly to a much tighter supply situation, but additionally to an expected increase in competition from South American exporters in Western Hemisphere long-grain markets. Long-grain exports to Iraq are also expected to be lower. Increased competition principally from Egypt is expected to reduce medium-grain exports to Libya. All rice ending stocks for 2011-12 are projected at 38.3 million cwt, up 5.1 million from last month, but down 10.1 million from the revised 2010-11 stocks. Projected global 2011-12 rice supply and use are increased from last month. Global rice production is projected at a record 458.4 million tons, up 2.1 million tons from last month, primarily due to larger expected crops in Brazil, China, the Philippines, and the United States. 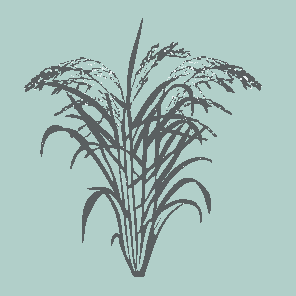 China’s 2011-12 rice crop is increased 1.0 million tons to 139.0 million, due mainly to an increase in the early rice crop. Brazil’s rice crop is raised nearly a million tons due to both an increase in area and expected yield. The recent surge in global prices accounts for the increase in planted area in Brazil from last month’s forecast. Global 2011-12 trade is nearly unchanged from last month. Global consumption is raised 0.7 million tons from a month ago due mostly to China. Global ending stocks for 2011-12 are projected at 98.7 million tons, up 0.7 million from last month, and the largest stocks since 2002-03. Stocks are raised for Brazil, China, the Philippines, and the United States. Worldcrops has said that for soybeans. Ending stocks by end-August 2012 are put at 165 million bushels, 29 million higher than the August report but still tight. 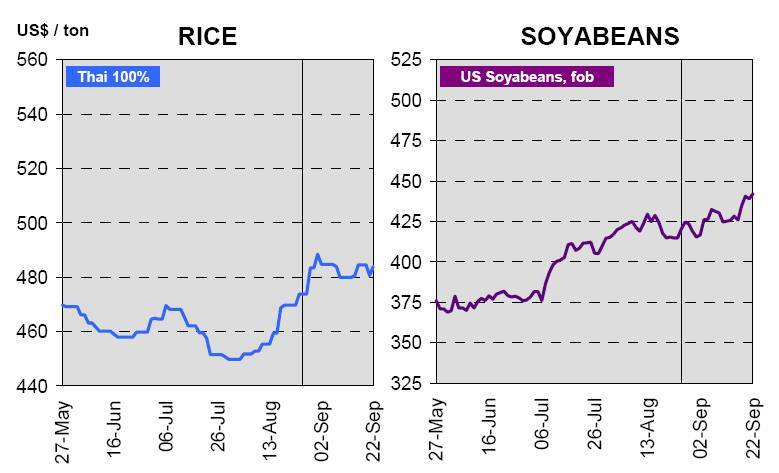 The US will have a reduced capacity to export soybeans and the futures price in our opinion will climb inexorably to $15/bushel and go significantly higher, if the weather outlook for the all-important South American soybean crop is unfavourable later this year. All in all this report has nothing which will astonish the markets immediately but lays the foundation for a significant bull-run in corn and, to a lesser extent, soybean futures in the coming months. Global wheat supplies for 2011-12 are projected slightly lower this month as an increase in beginning stocks is more than offset by lower production. Global beginning stocks are projected 4.9 million tons higher mostly reflecting increased stocks in Russia as feeding is reduced 2.0 million tons and 5.0 million tons, respectively, for 2009-10 and 2010-11. Beginning stocks for 2011-12 are also raised 0.5 million tons each for Argentina and Canada with the same size reductions in 2010-11 exports for each country. Partly offsetting is a 1.5-million-ton decrease for 2011-12 beginning stocks for Australia with higher 2010-11 exports. World wheat production is projected 5.2 million tons lower for 2011-12. At 664.3 million tons, production would be the third highest on record and up 16.1 million from 2010-11. This month’s reduction for 2011-12 mostly reflects a 7.1-million-ton decrease for EU-27 wheat output. Persistent dryness, particularly in France, but also in Germany, the United Kingdom, and western Poland, has reduced yield prospects for EU-27. Production is also reduced 1.0 million tons for Canada as flooding and excessive rainfall, particularly in southeastern Saskatchewan and adjoining areas of Manitoba, are expected to reduce spring wheat seeding. Production is increased 1.5 million tons for Argentina and 0.5 million tons for Australia, both reflecting favorable planting conditions and strong producer price incentives to expand area. Production is also raised 0.5 million tons for Pakistan as increased use of higher quality seed and adequate water supplies resulted in higher-than-expected yields. Global wheat trade for 2011-12 is projected slightly higher reflecting a 0.5-million-ton increase in expected imports by EU-27. Exports are lowered 3.0 million tons for EU-27. Export increases of 2.0 million tons and 1.0 million tons, respectively, for Australia and Argentina offset the EU-27 reduction. Exports are raised 0.3 million tons for Pakistan with the larger crop. Global wheat consumption is projected down 3.3 million tons, mostly reflecting a 2.5-million-ton reduction in EU-27 domestic use. Global coarse grain supplies for 2011-12 are projected down 7.8 million tons this month with lower beginning stocks and production. Reduced U.S. corn production, lower EU-27 barley production, and reduced corn beginning stocks in China, more than offset increases in China corn production. EU-27 barley production is lowered 2.2 million tons as prolonged dryness across western and northern Europe has sharply reduced yield prospects in the major producing countries. China corn area is raised for 2010-11 in line with the most recent official government area estimates with the year-to-year percentage increase for 2011-12 largely maintained. China corn production increases 5.0 million and 6.0 million tons, respectively, for 2010-11 and 2011-12 with yields unchanged month-to-month. More than offsetting the higher production levels is higher estimated corn consumption for both feeding and industrial use. China corn consumption is raised 8.0 million tons and 13.0 million tons, respectively, for 2010-11 and 2011-12. Together these changes leave projected 2011-12 corn ending stocks down 12.0 million tons for China. At the projected 51.0 million tons, China’s stocks would be down 2.7 million tons from 2010-11 and just below the levels of the preceding 2 years, better reflecting the continuing rise in domestic corn prices as production struggles to keep pace with rising usage. Although China’s stocks represent 46 percent of the world total for 2011-12, China is not expected to be a significant exporter. Global 2011-12 corn trade is raised slightly this month with higher imports for EU-27 and higher exports for Ukraine. Ukraine exports are raised 1.0 million tons with higher production and stronger expected demand from EU-27. Russia exports are lowered 0.5 million tons with lower production. Other important trade changes this month include a 0.2-million-ton increase in sorghum imports by Mexico, driving the U.S. export increase, and a 1.5-million-ton reduction in EU-27 barley exports with lower production and tighter supplies. Barley imports are lowered for Saudi Arabia and China. Global corn ending stocks for 2011-12 are projected down sharply this month, falling 17.3 million tons mostly reflecting the usage revisions in China. The projected 5.2-million-ton drop in U.S. ending stocks accounts for most of the rest of the decline. Global corn stocks are projected at 111.9 million tons, the lowest since 2006-07. Global 2011-12 rice supply and use are lowered from a month ago. Global production is projected at a record 456.4 million tons, down 1.5 million from last month’s forecast, primarily due to a decrease for China. Additionally, production projections are raised for Egypt and Guyana, but lowered for the United States and Cuba. China’s 2011-12 rice crop is projected at 138.0 million tons, down 2.0 million from a month ago; primarily due to the impact of prolonged drier-than-normal weather in the Yangtze River Valley affecting mostly early rice. Egypt’s crop is increased 0.9 million tons to 4.0 million due to a 33 percent increase in area—based on a recent report from the Agricultural Counselor in Cairo. The global import and export forecasts for 2011-12 are little changed from last month. Global consumption for 2011-12 is lowered 0.8 million tons, primarily due to lower consumption expected in China, but partially offset by increases for Egypt, EU-27, and Vietnam. Global ending stocks for 2011-12 are projected at 94.9 million tons, down 1.3 million from last month, due primarily to reductions for China and the United States which are partially offset by increases for Egypt, the Philippines, and Vietnam. The World Agricultural Supply and Demand Estimates (WASDE), the monthly forecast of the United States Department of Agriculture (Farm Service Agency, Economic Research Service, Foreign Agricultural Service) was released on 2011 March 10. Wheat – Global 2010-11 wheat supplies are projected 1.9 million tons higher reflecting higher production. Argentina production is raised 1.0 million tons based on higher reported yields. Australia production is raised 1.0 million tons with higher yields in Western Australia where wheat quality was not hurt by harvest rains as in the east. Other production changes include a 0.5-million-ton reduction for EU-27 with a smaller crop reported for Denmark and a 0.6-million-ton increase for Saudi Arabia on an upward revision to area. Global wheat trade is projected lower partly reflecting reduced import prospects for a number of smaller markets as high prices trim demand. The largest import reduction, however, is for Russia where imports are lowered 1.5 million tons. Despite last year’s drought, Russia appears to be meeting its wheat needs as the government’s export ban helps maintain supplies for domestic users. With lower imports by Russia, Ukraine exports are lowered 1.5 million tons. Ukraine’s export restrictions have also disrupted trade with non-FSU countries. Exports are lowered 0.5 million tons for EU-27 on tighter supplies and the rising value of the Euro. Although exports are unchanged for the Australia October-September marketing year, exports are raised 1.0 million tons for the 2010-11 July-June international trade year increasing expected competition for U.S. wheat exports over the next few months. Global 2010-11 wheat consumption is projected lower with the biggest change being a 1.5-million-ton reduction in expected wheat feeding for Russia. With increased global production and reduced usage, world ending stocks for 2010-11 are projected 4.1 million tons higher. Rice – Global 2010-11 projections of rice production, consumption, and exports are lowered from a month ago, and ending stocks are raised. The decrease in the global production forecast, still a record at 451.5 million tons, is due entirely to a decrease in the rice crop in India, which is partially offset by increases for Argentina and Brazil. India’s rice crop is forecast at 94.5 million tons, down 500,000 tons from last month due to an expected decrease in average yield. Drier than normal weather in the eastern and northern rice growing regions is expected to lower Rabi yields. The increases in Argentina and Brazil are due to an expected increase in harvested area. Global consumption is lowered 5.3 million tons to 447.0 million, still a record, primarily due to reductions in India (-4.0 million) and China (-0.5 million). Conversely, global ending stocks are raised 4.9 million tons to 98.8 million attributed mostly to increases for India, China, Bangladesh, and Burma. India’s 2010-11 ending stocks are raised 3.6 million tons to 21.6 million based on recently received information on government-held stocks. China’s 2010-11 ending stocks are raised nearly 1.0 million tons based on information from the Agricultural Counselor in Beijing. Global 2010-11 exports are lowered nearly 0.5 million tons, due mostly to reductions in Burma, China, and India. Coarse Grains – Global coarse grain supplies for 2010-11 are projected 2.5 million tons lower this month with lower corn beginning stocks and reduced corn, barley, sorghum, and oats production. Global corn beginning stocks are lowered 0.6 million tons with upward revisions to Brazil exports and India feeding in 2009-10. Global 2010-11 corn production is reduced 0.5 million tons as lower production in Mexico and India is partially offset by higher production in Brazil. Brazil corn production for 2010-11 is raised 2.0 million tons reflecting higher reported area and yields in the summer crop and expectations for increased area for the winter crop with government planting dates extended for crop insurance and loan programs. Mexico corn production is reduced 2.0 million tons as the unusual early February freeze destroyed standing corn crops across much of the northwest winter corn region, which normally accounts for about one-fourth of the country’s total corn production. Replanting is expected to offset some of the loss, but seasonally high temperatures in the coming months limit the growing season window. Global 2010-11 sorghum and barley production are each lowered 0.5 million tons and oats production is lowered 0.3 million tons. Lower sorghum output for India more than offsets an increase for Australia. Lower barley and oats output for Australia account for most of the reduction in world production for these coarse grains. Global 2010-11 coarse grain imports are raised this month as increases for corn and sorghum more than offset a reduction for barley. Corn imports are raised 1.1 million tons for Mexico with the lower production outlook. Corn imports are raised 1.0 million tons for EU-27 on stronger expected feeding. A 0.5-million-ton reduction for Russia corn imports is partly offsetting. Sorghum imports are raised for EU-27 and barley imports are lowered for Russia, Saudi Arabia, and China. Increased corn feeding in EU-27 is more than offset by reductions in feeding in Russia and lower food, seed, and industrial use in India and Mexico. Projected global corn ending stocks are raised slightly. The International Grains Council has released its October 2010 grain market report. The IGC has said that the outlook for world grains supplies in 2010-11 tightened further in the past month. Although prospects for wheat and barley crops are broadly unchanged from previously, the forecast of world maize production is cut, due to reduced crop expectations in the US and China. Wheat: With northern hemisphere harvesting nearly complete, the IGC projection of world wheat output is kept at 644 mt, a fall of 33 mt from the previous year, with reduced estimates for some countries notably the US and Australia, offset by increases for others, including China. Maize: Reflecting worsening production prospects in the US and China, the forecast of global maize production is cut by 10 mt to 814 mt (811 mt), still a record. Rice: At 449 mt tons, the IGC forecast of global rice production in 2010-11 is almost 5 mt lower than in September, largely reflecting a smaller-than anticipated official projection of India’s main crop. At 1,730 million tons, global grain output is projected 11 mt lower than in September and 3% below the previous year. By far the biggest decline is in the CIS – mostly in Russia – due to the drought. Within the total, much of the fall reflects smaller wheat and barley outturns, only marginally offset by a larger maize crop. In the southern hemisphere, prospects for wheat remain favourable, except for parts of Australia, while the maize outlook improved in Argentina. World grains consumption is projected slightly higher, at 1,785 mt, mainly because of increased feed forecasts for the EU and US. In the US, where the total includes a residual element, it is largely an adjustment for the use of early-harvested maize before the new marketing year began. However, global use of grain will be 1.5% higher than in 2009-10, underpinned by increases in all demand sectors. With global grains use set to exceed output for the first time in four years, world end-of-season stocks are expected to fall by 54 mt, to 345 mt. Nevertheless, they would still be nearly one-quarter above the 2006-07 low. 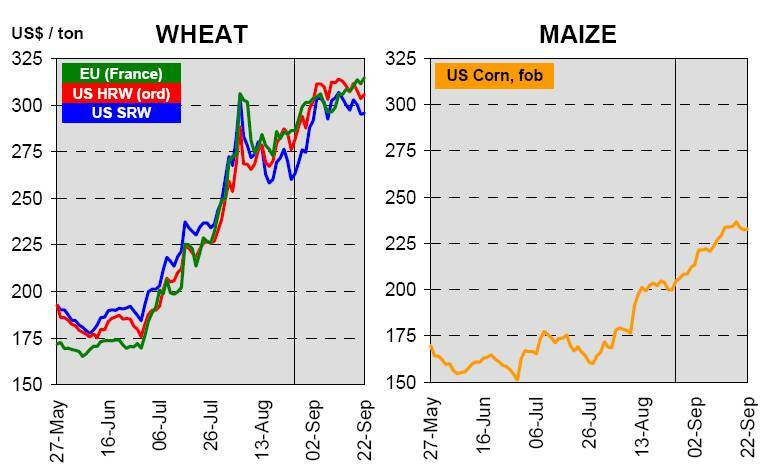 Although wheat and coarse grains prices have posted large gains since July, world grains trade in 2010-11 is projected to be marginally above the previous year’s total, at 240 mt, reflecting this month’s upward revisions for maize and wheat. World wheat trade is expected to decline, but this will be more than offset by a rise in maize import demand. A shortfall of nearly 30 mt in CIS exports is expected to be balanced by larger shipments by other exporters, notably the US, Argentina, Australia and India. The International Grains Council released its monthly Grain Market Report on 2010 September 23. In this report the IGC said that global grain prices advanced again in September, those for wheat having returned to the peaks reached in early August. While the initial trigger for the steep upturn in wheat and barley values in recent months was the fast deteriorating outlook for these crops in the Black Sea region, much of the more recent bullishness is attributed to concerns about smaller than anticipated US maize (corn) yields, as well as substantial new grain buying activity by importers. Grains outlook for 2010-11 – This year’s sharply reduced crops in the CIS and Europe will contribute to a fall of 1.2% in global grain supplies, reversing three successive years of stock building. World production in 2010-11 is forecast at 1,741m. tons, (1,787m. ), 4m. below the previous month’s projection. This follows downward revisions, for maize in the US and wheat in the CIS region, more than offsetting improved prospects in Australia. Significant reductions in wheat and barley output will outweigh another rise in maize, although prospects for the latter crop are downgraded slightly. 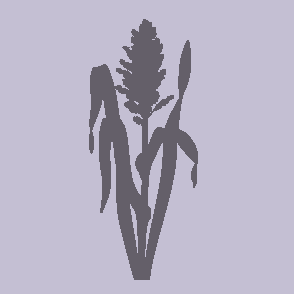 The difficult growing and harvesting conditions in parts of North America, Europe and the CIS have affected supplies of high-quality milling wheat and malting barley. Grain consumption in 2010-11 is projected to increase by 0.6%, to 1,780m. tons, but this represents a marked slowing compared with previous years as the overall rate of expansion in industrial use, especially for ethanol in the US, is scaled back. In the animal feed sector, maize use is expected to be boosted, while that of wheat will likely hold steady, but this will be more than offset by reductions in barley and other grains. With global grains consumption expected to exceed output after three surplus years, global carryover stocks in 2010-11 are projected to fall by 39m. tons, to 353m., mostly because of declines in the world’s exporters, notably Russia and the US. However, the total carryover will remain significantly above the lows seen earlier in the past decade. Global trade in grains is expected to fall in 2010-11, mainly because of reduced wheat shipments. At 237m. tons (239m. ), the total is 5m. 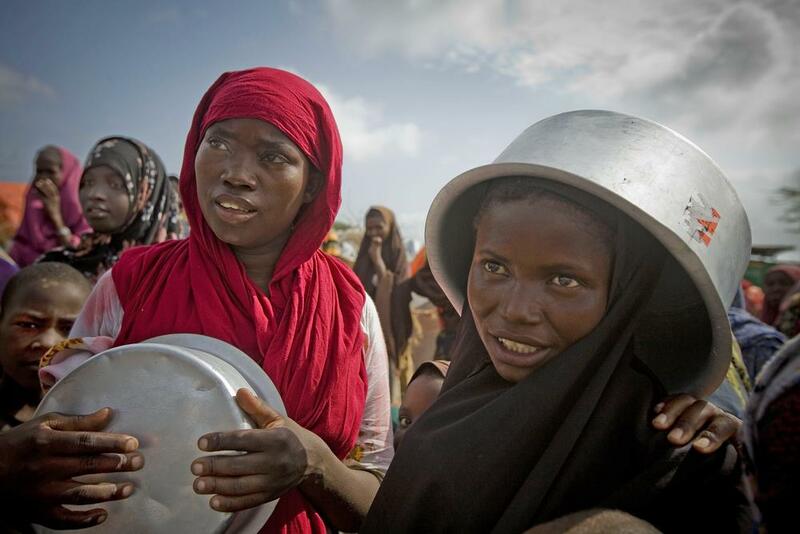 above the August forecast, following upward revisions for the EU, Russia and sub-Saharan Africa. Export forecasts for several countries, including Australia, Canada and the US, have been lifted, with total availabilities still seen as ample in a year which will see a huge shift in trade away from the drought-afflicted Black Sea region. In all, wheat and coarse grains shipments from Kazakhstan, Russia and Ukraine will fall by 27m. tons compared with 2009-10, with around half of this shortfall likely to be sourced in the United States. Selected Exporters: Australia is down 500,000 tons to 15.5 million based on logistical constraints. Canada is boosted 2.0 million tons to 17.5 million due to larger exportable supplies. EU is lowered 3.0 million tons to 21.0 million on reduced exportable supplies and quality concerns, particularly for German wheat. Iran is raised 450,000 tons to 500,000 due to greater exportable supplies and opportunities opened by reduced supplies in Russia. Kazakhstan is up 500,000 tons to 6.5 million on higher Russian import demand. Russia is raised 500,000 tons to 3.5 million based on exports shipped before the ban. United States is boosted 1.0 million tons to 34.0 million on strong demand, particularly for higher quality wheat. Selected Importers: Nigeria is up 400,000 tons to 4.0 million due to expected consumption growth. Russia is raised 1.4 million tons to 2.0 million due to increased demand for milling wheat caused by drought-reduced production. The USDA report recorded trade changes in 2009-10 as “large late-season adjustments reflect reported shipments”. These are – Selected Exporters: Canada is up 500,000 tons to 19.0 million. The United Arab Emirates is raised 450,000 tons to 950,000. Selected Importers: Indonesia is down 450,000 tons to 5.4 million. Iran is up 600,000 tons to 3.6 million. Turkey is lowered 300,000 tons to 3.2 million. 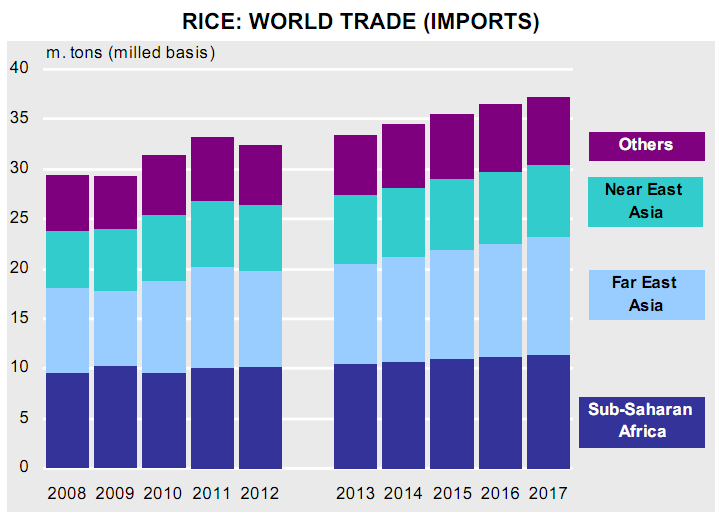 Rice world markets and trade – Despite weather problems in China and Pakistan, global crop prospects remain excellent said the USDA report. Record world production is expected to not only meet rising demand but also maintain global stocks at the highest level since 2004. Prices – though quotes from all origins are up somewhat from last month, Vietnam’s increase is the most dramatic. With 2010 contracts already at a record 6.2 million tons, Vietnam raised the minimum export price of 5% broken to $450 per ton FOB, essentially halting new sales and, for the first time, pushing above higher-quality U.S. #2/4 quotes ($445 per ton FOB). Vietnamese quotes are now only $30 below Thai 100B quotes, a stark departure from the $120 spread just 2 months ago. As sales stall in Vietnam, Thai sales are expected to increase as the government finally releases intervention stocks. U.S. long-grain sales are also expected to pick up on newfound competitiveness and a record crop. 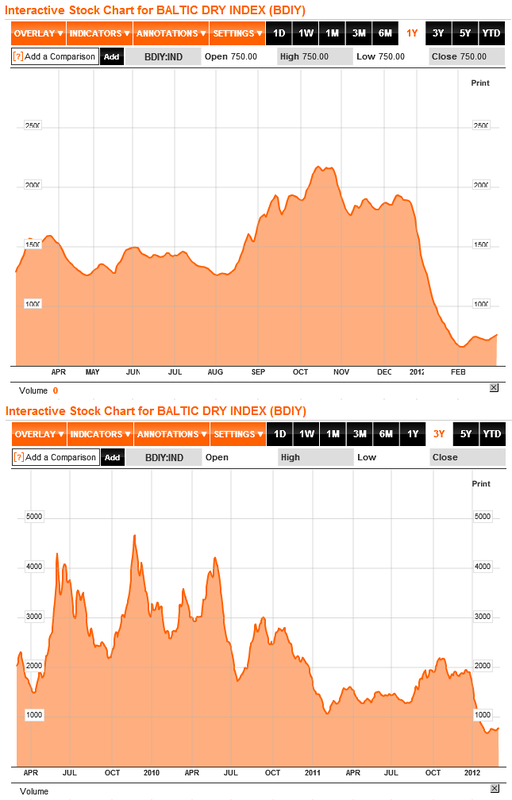 By contrast, the medium-grain trade is somewhat on hold as the California crop has yet to be harvested. In addition, many tenders in major markets have yet to be announced. 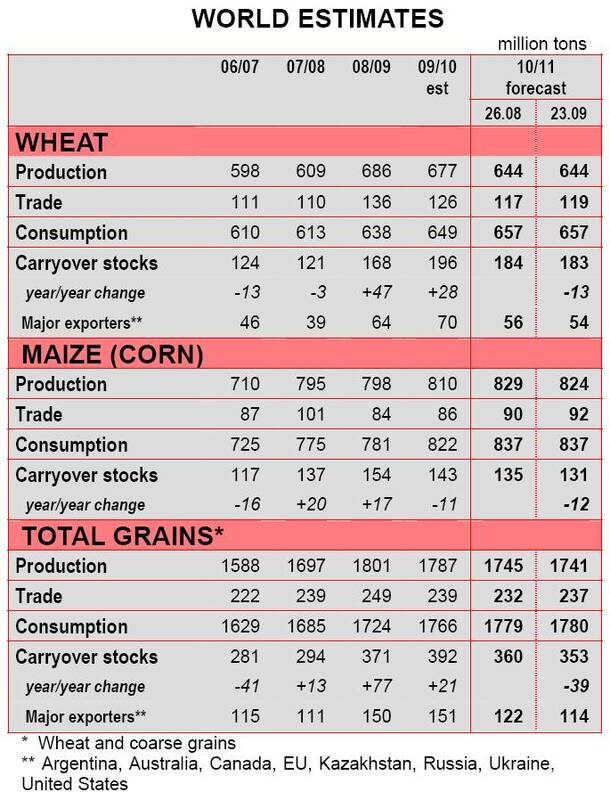 The USDA report forecast trade changes for 2011. These are – Pakistan’s exports are slashed 750,000 tons to 2.9 million as floods have reduced the crop and damaged infrastructure. Afghanistan’s imports are reduced 100,000 tons to 200,000, as Pakistan is by far the largest supplier due to proximity and relative prices. Iran’s imports are cut 300,000 tons to 1.2 million on the expectation that imports from Pakistan will fall. Thailand’s exports are down 500,000 tons to 9.0 million because the government stock release is happening much later in the year than originally anticipated. Vietnam’s exports are raised 450,000 tons to a record 6.2 million on contracts to date. By contrast, imports are dropped 100,000 tons to 400,000 on a slowdown of border trade with Cambodia. Indonesia’s imports are doubled to 500,000 tons as relatively high domestic prices have caused a surge in trade with neighboring countries. Iran’s imports are dropped 150,000 tons to 1.2 million on the pace of shipments. Nigeria’s imports are lowered 100,000 tons to 1.7 million on slower-than-expected imports from Thailand.